A film I saw recently reminded me that there are still powerful lessons to be learned from the past about the importance of speaking up when we see something intolerable. 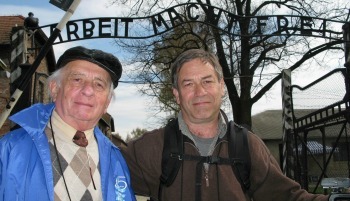 Adler, a soft-spoken man who still speaks with a Polish accent, survived the Dachau concentration camp and a death march, but lost mother, brother and grandparents in the Jewish ghetto of Pabianice, Poland, his younger sister in Auschwitz and his older sister in Bergen-Belsen. He emigrated to the United States as a teen-ager and eventually married and settled in Skokie, Illinois, a suburb of Chicago. He was in San Francisco with his son Eli Adler, who co-directed the film with Blair Gershkow; the work was billed as a “Heartwarming Story of Community, Transformation and Discovery.” Surviving Skokie describes what happened in the 1970s when a group of Neo-Nazis tried to march in Skokie. 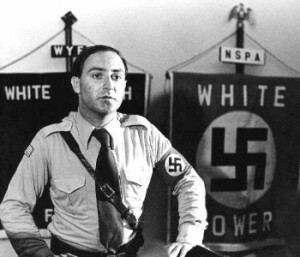 The hate-group had targeted the community because of its unusually large number of Holocaust survivors. Before Frank Collin, the leader of the group, came to Skokie, the survivors were mostly silent about their past. Eli Adler says he knew his family was different because he had no grandparents, no aunts and uncles, no cousins and there were other kids in Skokie like him. “They were making a shetl (small Jewish village) again,” Eli Adler says about the cluster of survivors in Skokie. But they never talked about their families’ histories until Collin arrived. And I was reminded again how important it is to keep telling these stories so no one forgets what can happen when a demagogue is allowed to go unchecked and unchallenged.